Recently I was asked how many shoes I own. I wasn’t keen on sharing the number. I’m ashamed of my shoe/clothes hoarding addiction. 137 pairs. Not including sports shoes, winter snow boots or rain boots. Why on earth do I need so many pairs of shoes? I firmly believe that shoes can make or break an outfit. They can be an outfit’s exclamation point or its sad ending. I’m not tall or lanky and shoes help me elongate what I lovingly refer to as my “short man legs”. Often I create an outfit from the ground up, starting with my shoes first, dependent upon my activities. I’m trying to replace my fancy “10 minute” aka “bedroom shoes” with more comfortable versions that are still stylish. This is one epic challenge and akin to winning the lottery. Most fashionable shoes aren’t made for my feet. The progress is slow, but I am beginning to weed out the shoes that are impractical and painful. Once I can find a replacement I will be saying goodbye to those red ones in the photo above. (Insert very unhappy face.) They are too pointy, too tall and have no straps. My feet walk out of pumps 90% of the time. (Even when I add in those little pads to stop my heels from coming out.) Am I the only person with this problem? I’m on the lookout now for some 2-2.5″ red heels with a little strap. I was high on new shoe fumes when I put them on my feet and they didn’t hurt. These will not replace those red pumps. My plan was good but I’ve already strayed. Keep tuned to see if I can get back on track! I will be sharing some of my favourite most comfortable shoes that I own and other comfortable shoes that I’ve researched in two more upcoming posts. How do I store all these shoes? Prior to getting these closets, my shoes were scattered throughout the house in five different places. 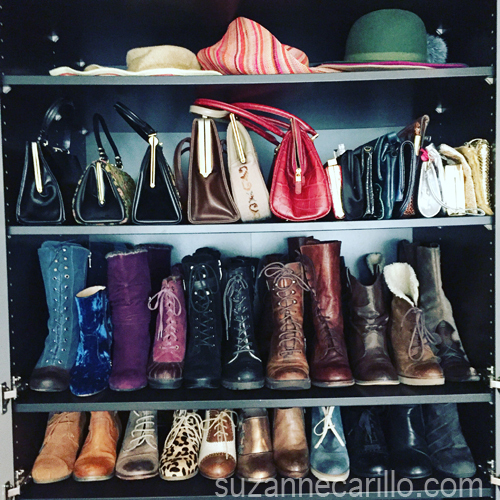 The closets are very deep and allow me to easily place one shoe behind the other so I am able to view my entire shoe and boot collection at a glance. I own quite a few pairs of boots and hats as you can see here. You can configure the Ikea wardrobe shelves to the height you require. In each of my closets, I have the upper shelf for hats stored inside boxes. My three drawers are divided with Ikea drawer organizers. I roll all my t-shirts so I can see them at a glance. The second drawer is for underwear, socks and tights all stored in drawer organizers. The third drawer is filled with accessories including bracelets, scarves, hats, watches, pins and hair accessories. In conclusion, this closet is my wardrobe saviour. I rarely have an issue finding something. There is a place for everything and everything in its place. I roll cardboard or newspaper and stuff my boots with it to keep their shape and make sure they stand upright. So now you all officially know that I am two steps away from being Imelda Marcos The Second. 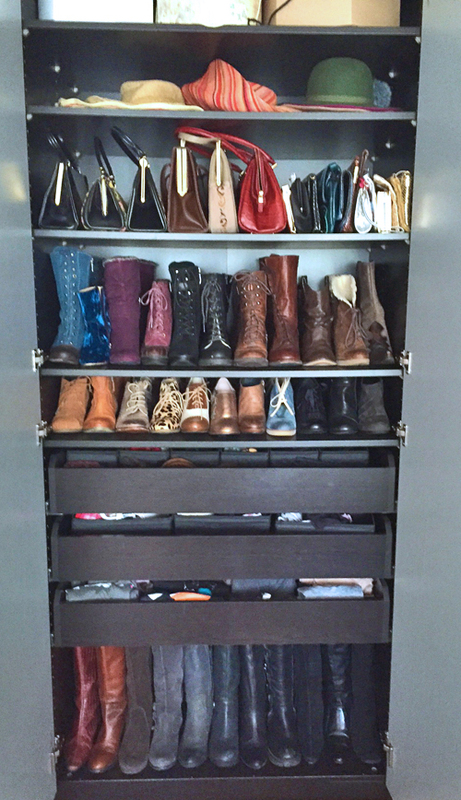 Do you have any special shoe/boot storage tips/secrets that you’d care to share? You know I need all the help I can get. OMG this is genius! Apart from the fact I have nowhere in my house to put another wardrobe, I totally want to do this now!! 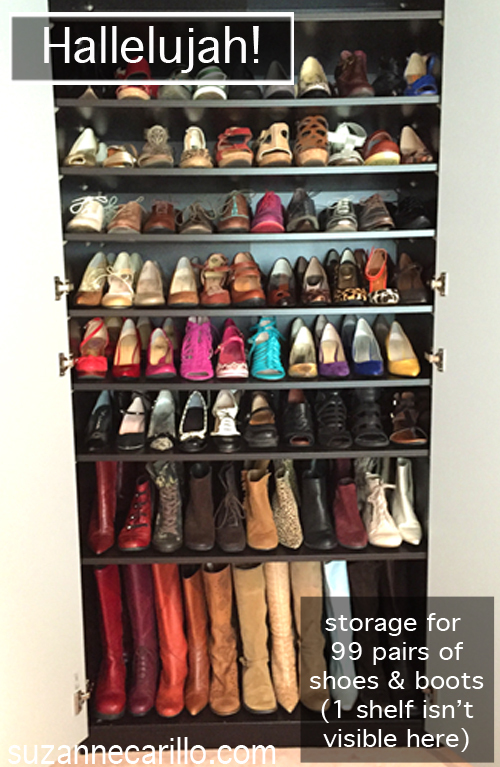 It would solve my shoe storage nightmare. And it really is a nightmare 🙁 And I don’t have anywhere near 100 pairs either. Bah. They need to make hidden wardrobes that come down from the ceiling or are stored under the flooring. Now there’s an idea! Great post — funny, informative and honest. We’re entertained and educated by your explanations of shoe-addiction, particular needs and storage solutions. The reason I ask this question is to force us to confront the reality of our lives instead of dwelling in a delusion we often create. Doing this can be enlightening. Thanks for sharing your insights and thoughts. I really envy a large shoe collection. 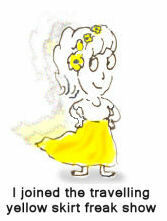 Having very broad feet and living in a warm climate I struggle to buy stylish sandals which don’t hurt my feet. Presently enjoying the Seychelles range, very comfortable and not the usual ugly sensible walking shoe! I love organization and agree IKEA is the best choice for storage. Thanks for giving us a peek into your shoe collection. Don’t feel guilty as you have to get through the seasons so need plenty of shoes and boots for all weather and occasions….Right? But let’s talk about the practicality of having many pairs of shoes—1-they still fit even if you gain 5 pounds 2-It’s important for your feet to switch them out daily (and sometimes even twice a day—this fact per a podiatrist) 3-They do make the outfit—fact not fiction and 4–They make us happy (another fact) so the amount you have is perfectly perfect—especially since you came up with such a great storage solution! 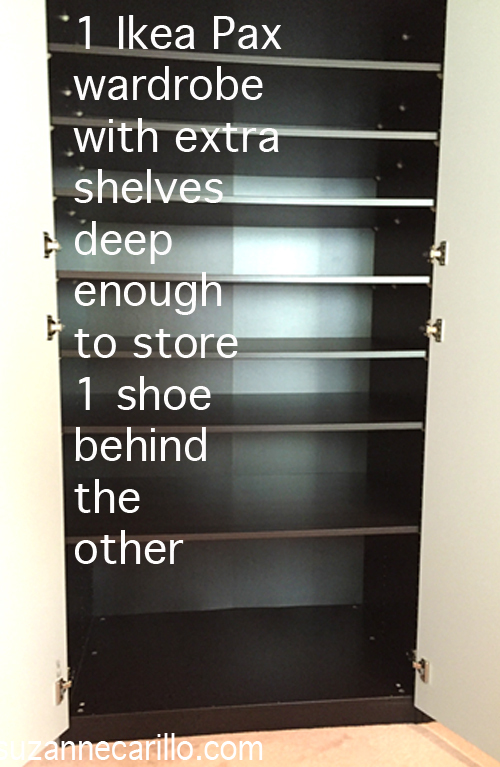 As an organizational freak–I think you are extremely smart to put one shoe behind the other!! I don’t have the problem of walking out of my pumps—maybe because I have a wide heel? So envious… I haven’t got enough room to put these closets in… ???? I haven’t counted my pairs of shoes, but I might get close. For now I will say I own much less shoes than you haha. You are very organised and I wish I was. Behind the closet door it is disaster. 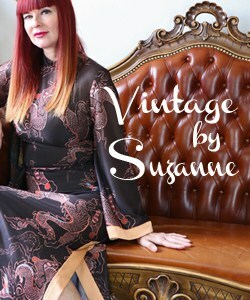 WOW Suzanne!!! Most impressive!! I’ve never actually counted my shoe (like you, I’d be embarrassed) but I don’t have them BEAUTIFULLY ORGANIZED like you do. Clearly you have some desire to control your collecting…? What would Patti say? This is organization of Olympic stature. Excellent. Absolutely EXCELLENT management skills. I can only aspire to attain your shoe collection and closet success. Alas, lack of space is my nemesis. Arrrg. I agree that shoes are a major part of a look. And like you, my feet have growing demands. That pisses me off, but what can I do? There’s a huge demographic of women in the same situation so we should be presented with more and more stylish shoe options. How long can you keep them looking that neat? I know this is NOT Photoshop. Heh. Your shoe collection is fabulous and if they’re all size 7s like the Tieks I could share them just fine. 😉 If it weren’t for living in the tropics and having the need to be able to pack up all my stuff in suitcases if I have to move away….I’d have many more pairs. Shoes tend to draw me magnetically. Ummmm. I have a lot of shoes. But nothing, NOTHING compared with my man’s shoe collection. He has big feet so your one fore/one aft wouldn’t work …. hmmmm. I definitely have a clothing “problem”, but until recently, I didn’t own a lot of shoes. I’ve always been afraid of being too tall, so that eliminates a lot of lovely shoes. 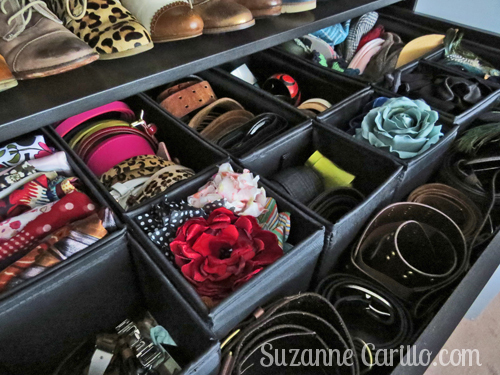 Your closet/storage is so wonderful. I have nothing to add – I bow to your expertise :)! I need that shelf!!! And I need to tell my husband how many pairs of shoes you own so he’ll get off my back. Don’t worry friend, I’m probably right about where you are as far as numbers go. I’m also right with you on the 2.5″ height limit…damn old lady feet…lol! 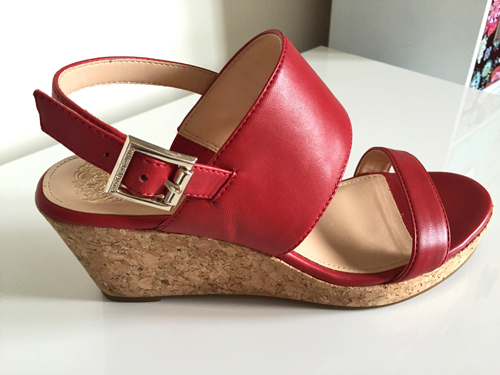 I’ve found that i can go higher if it’s a wedge or block heel with a bit of a platform in the front. I don’t have so much trouble with pumps, but I cannot wear a sling-back to save my soul. Not enough heel “bump out” to hold up the strap. 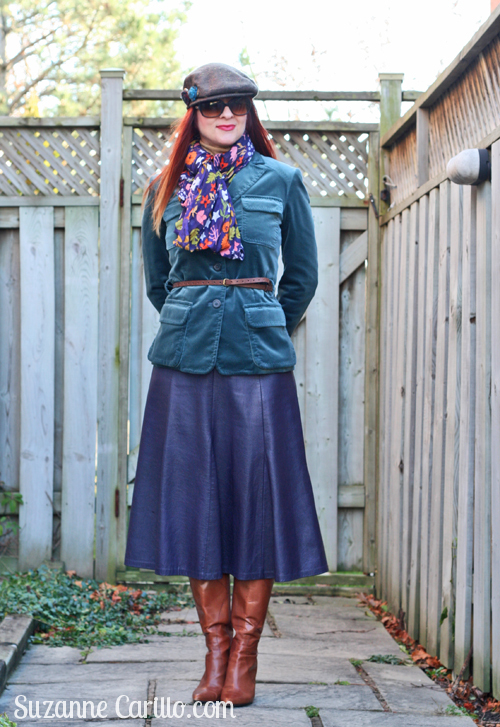 Love the look of hem, but just cannot.make.them.work. I love your shoe solution. 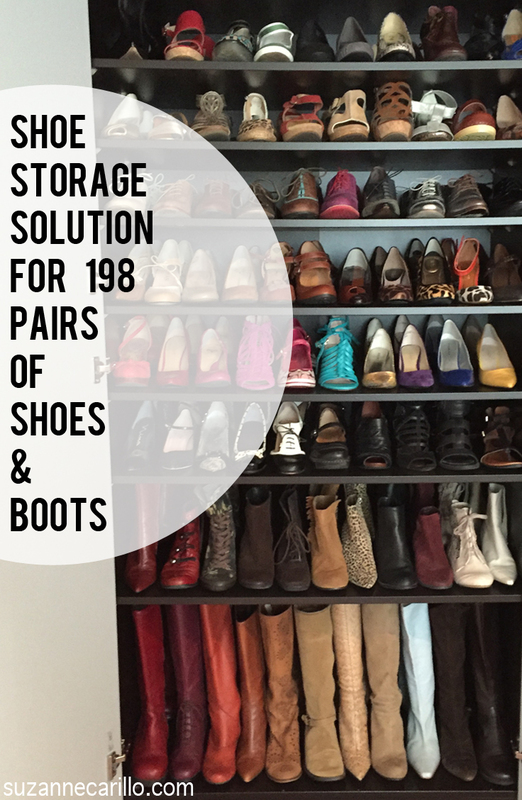 I have maybe half as many shoes as you and definitely need to come up with a better storage solution than what I currently have–which is, keeping them in their original box, stacked on closet shelves. Ah, fellow shoe owner. You do make me feel much better. Recently I spoke about feeling guilty about using a fake American address to get a pair of shoes (still can’t bring myself to do it) and a friend questioned whether my guilt should not lie with the number of shoes I have instead – wasn’t it obscene? (111 pairs) I think my contribution to the world would be much less valuable if I did drugs or alcohol or gambling or shop-theft or miniature railways rather than shoes. I bring happiness to people at work when they can see a less than boring appendage to our more than boring uniforms! Downsides certainly are foot pain and the fact that unless you wear more than one pair a day, you can only wear each pair three times a year. I have a night shift room (coz I work night shifts and I need a dark place to sleep) and it is as wide as a bed and an IKEA bookshelved wall. That wall holds all my shoes. IKEA is a shoe lover’s saviour. You have magnificent shoes and I am so glad it is your addiction! This maybe embarrassing but I am pretty sure I have close to 300 pairs of shoes (oops is that too many)??? I have tried to trim what I don’t wear and have done a good job of getting rid of things but some how they keep coming home with me. I love your organization skills! Can you come and help me? There’s very little I enjoy more than looking through a friend’s wardrobe so this post is an absolute joy, your collection is amazing and is displayed like art. I’m not normal, my collection is almost entirely secondhand and consists of boots or sandals. Good shoes are wasted under my maxis and just seem to hurt. One can NEVER have too many shoes!! Love how you stored everything. They just opened an IKEA here in Vegas. Plus, I forgot…we wear the same size shoe! Maybe we should do a shoe swap when you finally make it to Vegas! What a great way to store your shoes. I have issues too with storing mine, however I have downsized from about 130 to 65-70. I do plan to downsize even more, one pair at a time. My biggest issue are bags. Actually that’s exactly what I was thinking, and I already know we share the same size?. I swear we are two peas in a pod! Maybe I’ll go count mine tomorrow (just to make you feel you’re not alone). I also began the journey of trying to say so long to those “bedroom” shoes. Why is this more difficult than it should be? I also have the exact problem with pointy high heel pumps, my feet come out in every single step! And I can’t wear those silly flats for the same reason. But I’ve not tried those IKEA closets yet but I just informed Par what out next project will be, haha. Love this idea!!! Thank you my friend for being my partner in crime. You are a collector in the true sense of the word, Suzanne. Your collection is not only gorgeous and well-organized, but also beautifully displayed! I have only recently organized my shoes and keep them in special plastic containers (one pair per box). It works for now. I think I have about 30 pairs of more or less “pretty shoes”. And a few pairs of boots. I’d love to have such a beautiful closet some day though! I think when it comes to collecting, it isn’t about quantity – it’s all about passion. I really need these shelves but I don’t think I have room for them. I probably have the same amount of shoes as you but mine are under the beds as well as in the wardrobe and in the loft! 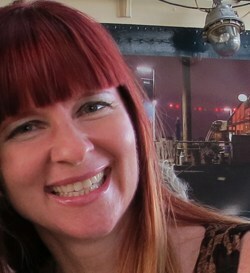 I have plantar fasciitis so can’t wear flats and high heels hurt my back, I have bunions too…oh the joy! Fitflop shoes are a godsend! Where can we find this wonderful wardrobe? I have been looking for the perfect design plans for a shoe shelf for my wife. Everything design I came up with, I knew there wouldn’t be enough space (side by side)…….but one in front of another……PERFECT. I can take advantage of the depth of my closet!!! I will probably incorporate Murphy Doors in my new house to accommodate my shoe/hat/scarf/jewelry collections. And My MAN found this out!